Harry Weber’s sculpture of J.W. “Blind” Boone was revealed at a reception for the J.W. “Blind” Boone Heritage foundation. 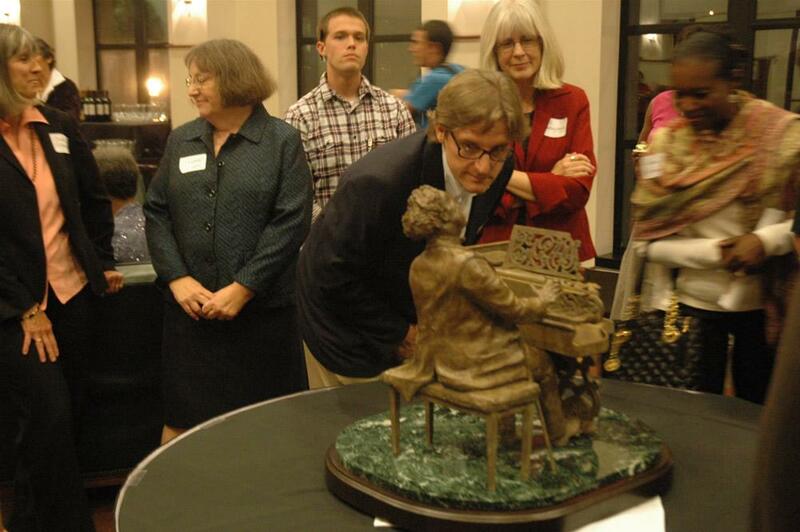 More than 50 people gathered at MU’s Reynolds Alumni Center Monday night to witness the unveiling of a sculpture of Blind Boone to go in the J.W. “Blind” Boone House in downtown Columbia. Missouri sculptor Harry Weber created the sculpture, which will be displayed in the tribute garden and if the project gets enough funding, a life size version of the sculpture will stand in front of the house on 4th Street. Weber says that he has been working on a sculpture of J.W. “Blind” Boone for a few years now. He says he set out to capture the grace he imagined that the musician exhibited through his music. 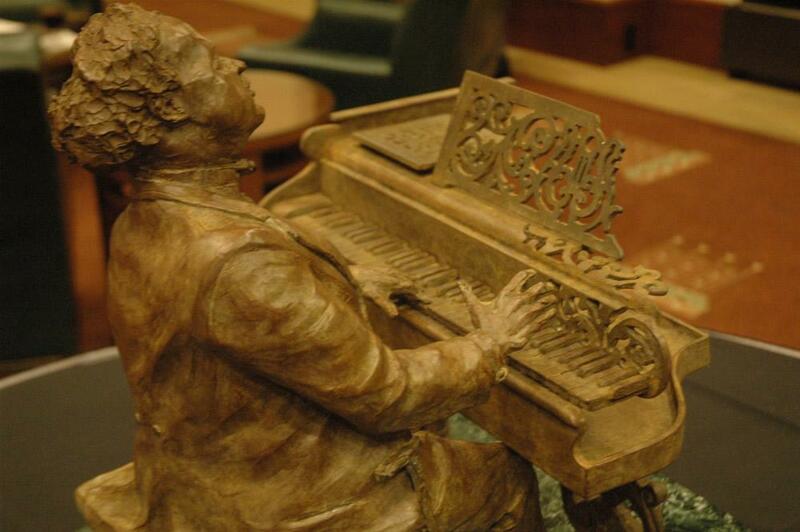 His finished work is an approximately two-foot-tall sculpture that’s cast in bronze and depicts Boone playing at his iconic piano. The J.W. “Blind” Boone Heritage foundation approached Weber three years ago to create the sculpture. Weber says he went through many extra steps to create the final product. As the cover came off during the unveiling ceremony, many members of the audience oohed and ahhed over the sculpture. Among them was foundation board member Lucille Salerno. Salerno has been involved with the foundation since it began in 1997. She believes it’s important to honor Boone and his contributions to music. The musician first played in Columbia in 1880 and died there in 1921. He is credited with merging traditional African-American music with European music to create ragtime music, which was popular in the late 19th and early 20th centuries. The foundation hopes to renovate Boone’s home and create an educational center. Columbia Convention and Visitor Bureau executive director Lorah Steiner says that there will be many educational programs at the center. Steiner says the Columbia Convention and Visitors Bureau sponsored Weber’s $11,000 sculpture which will be displayed in the Tribute Garden behind the house. There are plans to have a larger than life-size version of the sculpture of Boone in front of the home. Steiner expects this statue to cost $200,000 and she expects the total cost of the project, excluding the life-size sculpture, to be around $500,000. The foundations treasurer and a fourth-generation descendent of Boone, Barbra Horrel says that the foundation is raising money for the project. The bricks can be inscribed with the donor’s name or a tribute and will be part of the walkway in the Tribute Garden and outdoor performance area. The foundation’s president Clyde Ruffin, is the chair of University if Missouri’s Theatre Department and a pastor at Columbia’s Second Ministry Baptist Church. Ruffin says it’s an important project. Ruffin says the exterior renovations to the property are 95% complete. After the exterior is finished the foundation will refurbish the interior of the home, create the Tribute Garden and then construct the larger sculpture of Boone. The foundation has not set a date of completion for the project, but board members hope to have the project completed in three to four years.